Hi world! 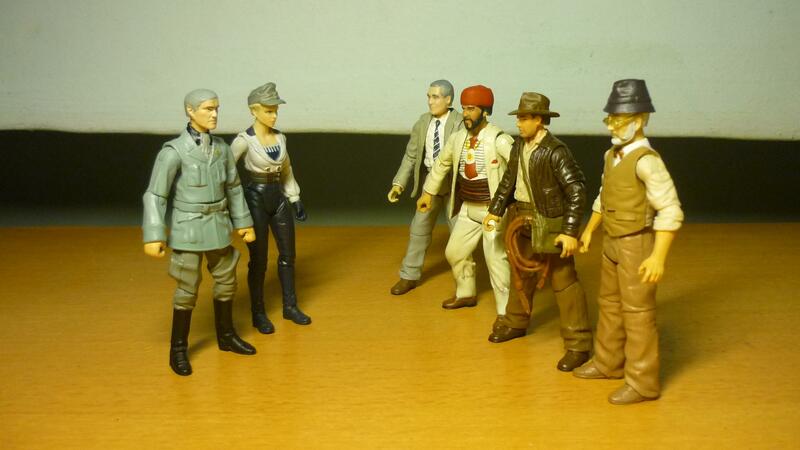 My first post for 2014, and thought I start off with an Indiana Jones custom showcase. Now on with the showcase! 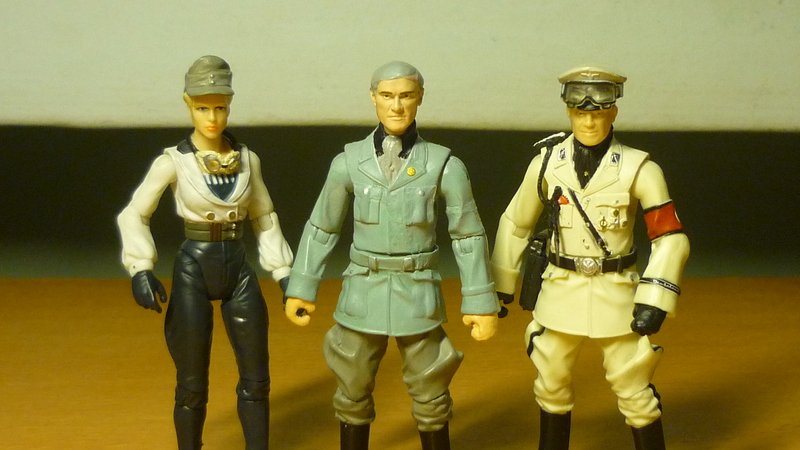 The Nazis are now in the last leg of their quest for the Holy Grail, with Colonel Vogel leading the Nazi expedition into the Canyon of the Crescent Moon. 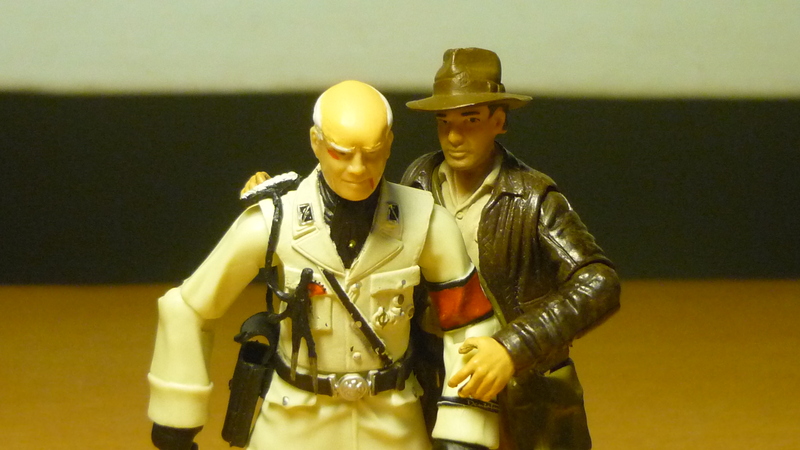 When Indiana Jones shows up and tries to disrupt their efforts, Vogel relished in the opportunity to finally get rid of that irritating troublemaker, who had not only caused the deaths of Vogel’s fellow SS colleagues back at Castle Brunwald, but Indy had also humiliated Vogel by throwing him off the Zeppelin. 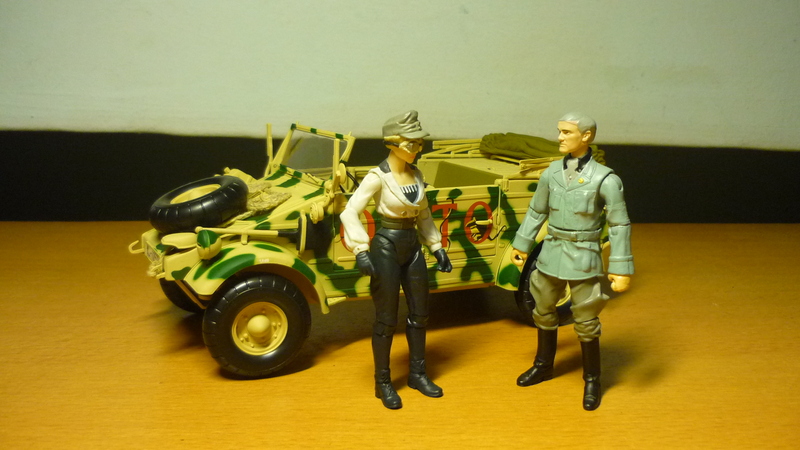 Revenge was the only thing on Vogel’s mind, with him going so far as to blast a stuck kübelwagen off the tank’s turret just so that he could continue his pursuit of Indy. This time it’s personal. Two main changes were made to the figure. 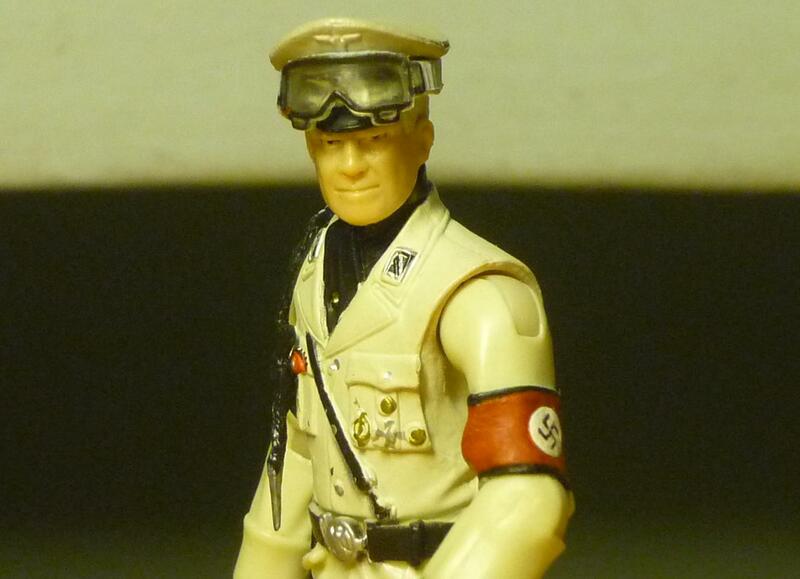 The Nazi insignia was painted onto the previously blank armband, and a pair of goggles was added to the military cap. 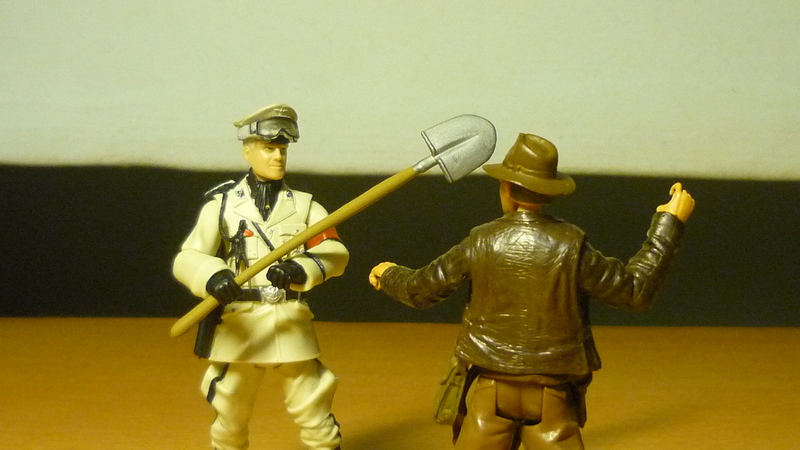 The fight goes onto the tank, and Vogel grabs a nearby shovel. An alternate head for Vogel! Indy bashes Vogel against the gun turret, and Vogel gets all bloodied and bruised. Hired by the Nazis’ in their quest to find the Holy Grail, Elsa would stop at nothing to obtain what she considers is her rightful prize, going so far as to manipulate the affections of Dr. Henry Jones Sr., and later also doing the same to his son Indiana Jones. And her efforts had paid off, the Nazis now know where the Holy Grail is located and an expedition has embarked towards the Canyon of the Crescent Moon. As Colonel Vogel and his men ward off an attack by Indy, Elsa and Donovan proceeded towards the Grail Temple, where Donovan can’t wait to have his drink and gain eternal life. 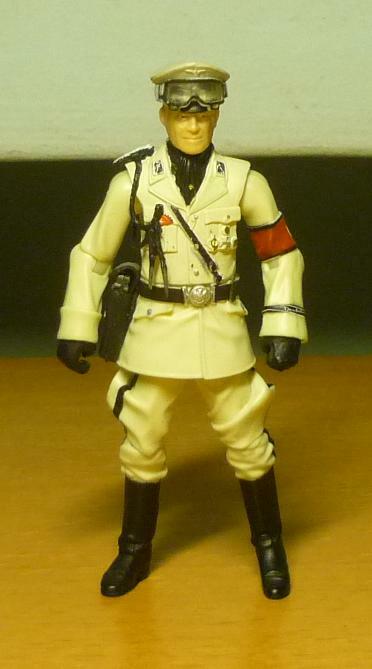 Field cap – From any “The Ultimate Soldier XD 1:18” WWII German Soldier who comes with a field cap. 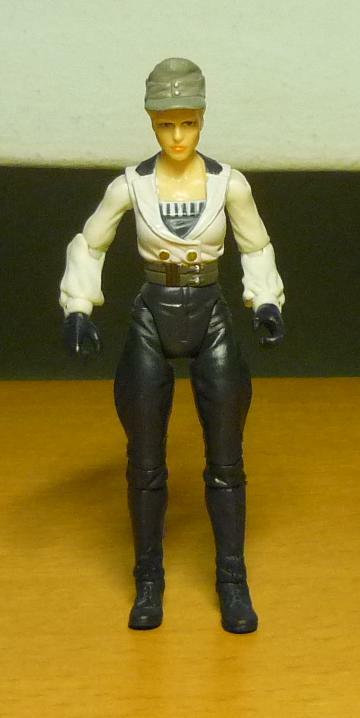 The original Elsa figure was based on her appearance towards the end of the movie, when she had already taken off her field cap. Elsa wore her field cap during the canyon scene and at the Grail Temple. The only change made to Elsa was the addition of a field cap. This involved slicing off the top of Elsa’s hair, and transplanting the field cap over. 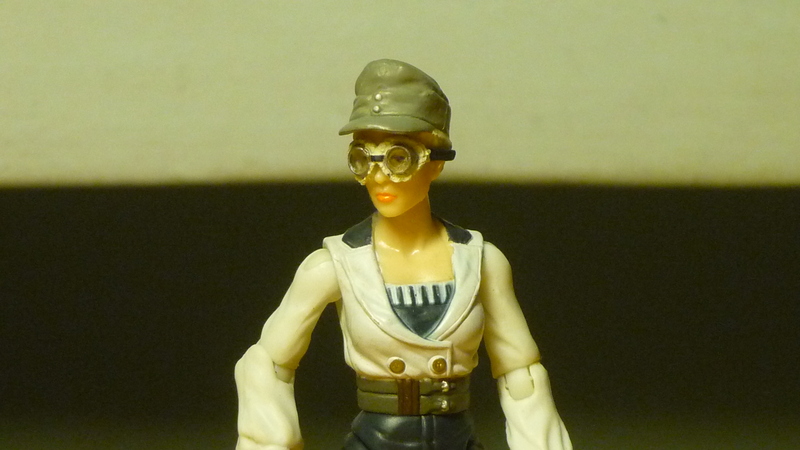 Close-up of Elsa, with a pair of goggles borrowed from Lord Asriel (“The Golden Compass”). Elsa and Donovan confer on their progress. Face off at the Grail Temple. Some people actually speculate that Elsa also screwed around with these other two.